Countdowns usually start at the highest number and head down, which in a ranking means starting at the bottom of one’s list. I decided to put my best foot forward in 2014, and yesterday’s post began with my Nos. 1-5 images. Today I complete my review of my top 2013 images (as determined by me, of course) with Nos. 5-10. OK, for you purists, the slideshow begins with No. 10 and shuffles to No. 1 — a true countdown. By the way, the slideshow will begin automatically. Or you may advance the photos yourself. (NOTE: Clicking on an image produced a full-sized version in a separate browser window). I’m going to get right to it. For my preamble, overview and backstories for the top-five images, see yesterday’s post. 6. LAST SUNSET AT CHESTERMAN. Equipment: Nikon D800, Nikkor 14-24mm f2.8, Really Right Stuff TVC-33 Tripod, Really Right Stuff BH-55 Ballhead, Lee Filters Holder, Lee Filters 0.6 ND Grad Filter, F-Stop Guru Camera Bag. Exposure: 1/2.5 seconds at f22 and ISO 100. This is my most memorable and sentimental image of 2013. Florangela and I spent a week in Tofino, where we were married 10 years earlier. 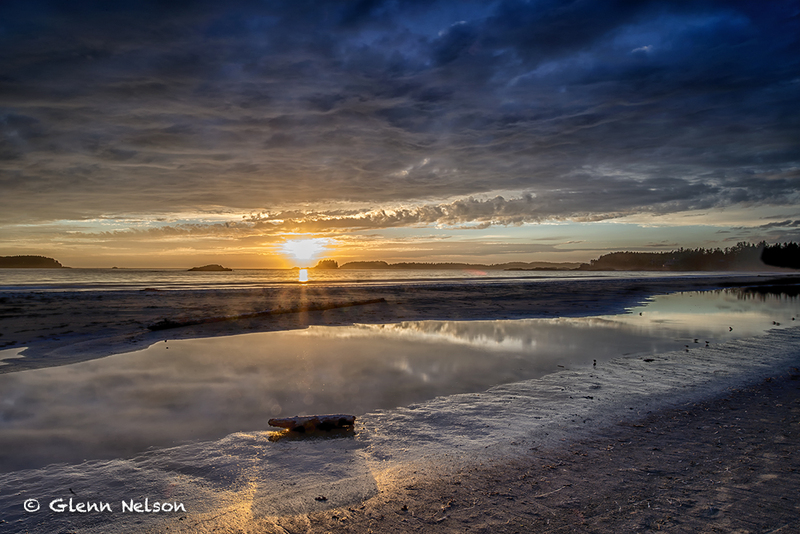 We had daily visits to Chesterman Beach, where the sunrises and sunsets were spectacular each of the late-August days. On our last night, we packed a picnic, arrived about an hour before sunset, and just enjoyed the show. I had my gear set up in front of us, and snapped a picture every once in a while. To make this image a little closer to ideal, the sun would just be peaking over the horizon and I’d have a lot nicer sunburst. But this image offers up a little more dramatic sky, a group of our friends the Western Sandpipers in the pool and, best of all to me, a rim of light around the shadow from the log. And if you could blow up this image, you would see there is a fantastic, but tiny, tiny sunburst in the left side of the log. 7. 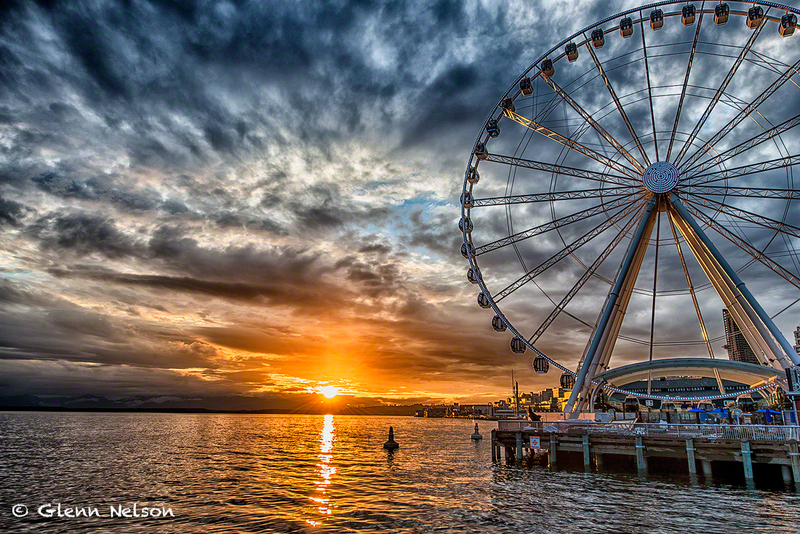 GREAT WHEEL SUNSET. Equipment: Nikon D800, Nikkor 14-24mm f2.8, Really Right Stuff TVC-33 Tripod, Really Right Stuff BH-55 Ballhead, Lee Filters Holder, Lee Filters 0.6 ND Grad Filter, F-Stop Guru Camera Bag. Exposure: 1/20 second at f11 and ISO 100. This image passes the “impact” test, and I’ve received about as many positive comments about this picture as any I created last year. The sky is dramatic, the details sharp and the composition balanced. However, the shot betrays my inexperience. As I mentioned in my explainer for the Chesterman Beach sunset, a lower sun would have yielded me a better sunburst. The one in this image is a little better because of the sun’s position, but I blew it in terms of not closing down my f-stop enough. That’s one lesson, but the larger lesson is that you cannot have the moment back. As a writer, I could always compensate for missing exact moments or details with reporting. No such outlet in photography. 8. 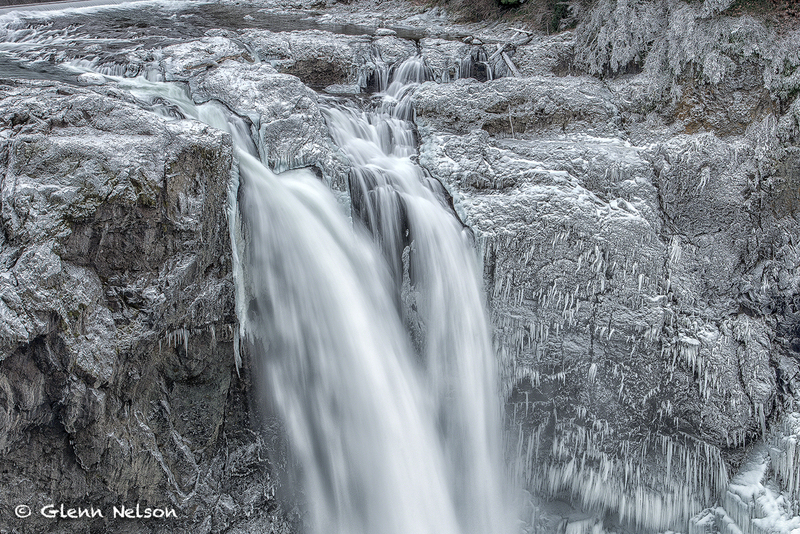 FROZEN FALLS. Equipment: Nikon D800, Nikkor 70-200mm f2.8, Really Right Stuff TVC-33 Tripod, Really Right Stuff BH-55 Ballhead, F-Stop Guru Camera Bag. Exposure: 1/2.5 seconds at f22 and ISO 100. On another day, in another moment, I’d rank this image higher because I really like it. Just looking at it gives me the chills, which is the whole point. I went to Snoqualmie Falls on a whim. I hadn’t been in so long because of my issues with height, but felt strong that day. I intended to shoot from the base, looking up, for a different perspective, but the boardwalk access was closed because of slippery conditions. I didn’t know about the ice formations around the falls; heck, I didn’t know such a thing even could happen. It was so impressive and of course the platform was ringed with photographers. While everyone else had their wide-angle lenses out, I reflexively pulled out my zoom, thinking I’d forego what was the “usual” view of this often-photographed landmark. The magnification not only yielded great detail, such as the abundant icicles, focusing on this part of the scene also provided an almost black-and-(mostly)-white effect that accentuated the chilliness of the scene. 9. EARLY BIRD. Equipment: Nikon D800, Nikkor 500mm f4, Nikkor AF-S Teleconverter TC-14E II, Wimerley Gimbal Head, Really Right Stuff TVC-33 Tripod, Really Right Stuff Long Lens Support, F-Stop Guru Camera Bag.Exposure: 1/1000 at f5.6 and ISO 640. As I alluded to in my previous post, one of last year’s big lessons was about patience. It seems counterintuitive to many in this iPhone-camera-run-and-gun world, but you really have to stop, assess and wait. In this case, I went to the North Jetty at Oceans Shores during the Gray’s Harbor Shorebird Festival in April, in search of Turnstones and Black Oystercatchers. But I noticed the giant flock of Western Sandpipers (like this one), Dunlin and other smaller shorebirds, going to and fro with the waves. I staked out one of their mostly frequented areas, got real low and waited. Eventually, the birds apparently got used to me and ventured close enough for me to get pictures like this. 10. 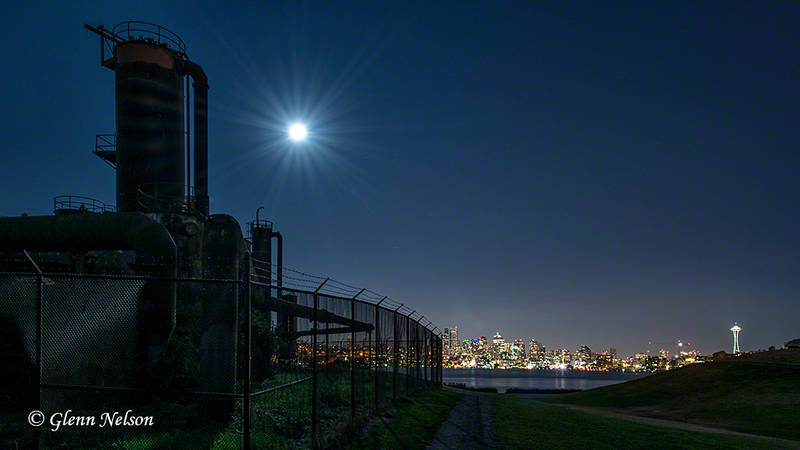 MOON OVER GAS WORKS. Equipment: Nikon D800, Nikkor 14-24mm f2.8, Really Right Stuff TVC-33 Tripod, Really Right Stuff BH-55 Ballhead, Nikon MC-36 Multi-Function Remote Cord, Black Diamond Head Lamp, F-Stop Guru Camera Bag. Exposure: 1 minute, 50 seconds at f16 and ISO 100. The full and nearly harvest moon presented an opportunity to make a shot from somewhere in Seattle that I’d never photographed. The challenge is that the Seattle skyline from Gas Works Park is so ubiquitous that it’s nearly cliché. Walking around, I got the idea to make a long-exposure shot incorporating the long-dormant gasification plant. The shot also captured a full moonburst and a touch of the Seattle skyline, along with the iconic Space Needle for good measure. Other photographers probably would have stitched together one or more exposures to avoid the fuzziness of the skyline from the long exposure, but I’m not there yet. 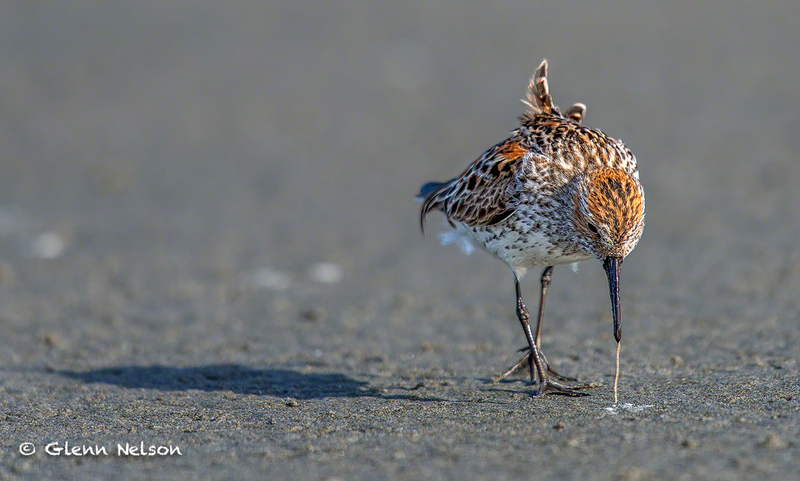 No images captured with my Nikon D3S, a far-more expensive body than the D800, made the cut. For what I’ve landed on as subject matter, I just like the detail the D800 offers. There are, however, times when the speed (autofocus and burst) of the D3S is necessary. 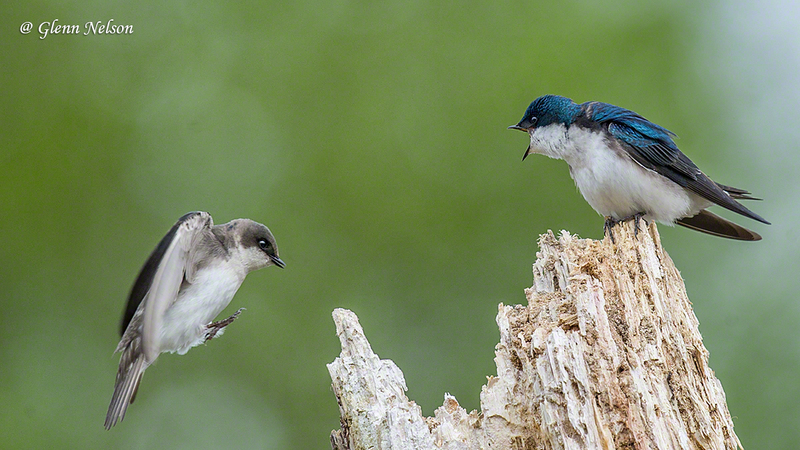 One of the images that didn’t make the cut (barely) is the following of Tree Swallows from Spencer Island. The backstory, plus more from the scene, are available here. Have a photographically great 2014, everybody!